US Vice-President Mike Pence has said his country’s “era of strategic patience” with North Korea is over. Mr Pence first made the remarks at the demilitarized zone (DMZ), the area dividing the two Koreas, during a visit to South Korea to reaffirm ties. Mr Pence, whose father served in the Korean War, visited the truce village of Panmunjom, where the war’s armistice was signed. Speaking alongside South Korea’s acting President Hwang Kyo-ahn later, he said North Korea had conducted nuclear and missile tests as the previous US administration had observed a policy of “strategic patience”, but this was now over. “Just in the past two weeks, the world witnessed the strength and resolve of our new president in actions taken in Syria and Afghanistan,” Mr Pence said. 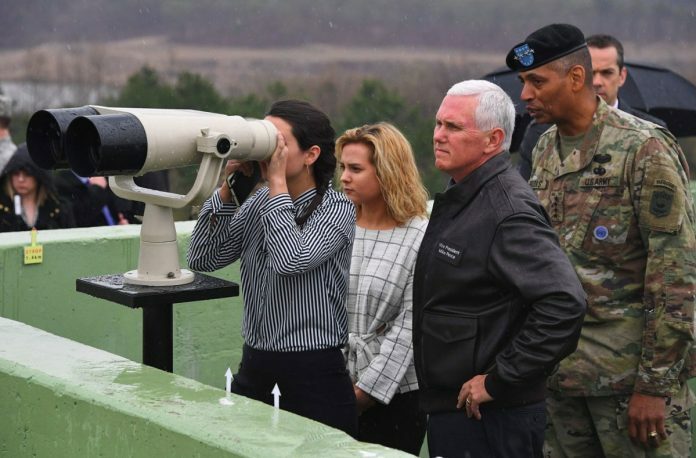 Mr Pence’s latest comments echoed those made by Secretary of State Rex Tillerson, who warned that pre-emptive military action was “on the table” when he visited the DMZ last month. Russia’s Foreign Minister Sergei Lavrov said Moscow would not tolerate “missile adventures by Pyongyang” but a unilateral use of power by the US would be “a very risky course”. On Sunday, Lt Gen HR McMaster, the US top security adviser, said his country was working on a “range of options” with China, the first confirmation the two countries were co-operating to find a solution to the North Korean issue. US President Donald Trump also said on Sunday that Beijing was “working with us on the North Korean problem”. He had stated last week that the US and its allies may “deal with” Pyongyang if China did not. The BBC’s Stephen Evans in Seoul says US policy now seems to be to persuade China to contain North Korea while keeping the economic and military pressure on. China, historically Pyongyang’s sole major ally, has reiterated its call for North Korea to stop all tests, and has also called for a peaceful solution. Chinese Foreign Ministry spokesman Lu Kang told reporters in Beijing on Monday that the Korean peninsula was “highly sensitive, complicated and high risk” and that all sides should “avoid taking provocative actions that pour oil on the fire”. He added that the crisis is between the US and North Korea, noting that “China is not the initiator of the Korean peninsula nuclear issue”. Besides Sunday’s launch, North Korea has held a series of large-scale events in the past week including a massive celebration and military parade on Saturday. Also on Monday, North Korean leader Kim Jong Un penned a letter to Syrian President Bashar al-Assad to mark the 70th anniversary of Syria’s independence, according to state news agency KCNA. “I express again a strong support and alliance to the Syrian government and its people for its work of justice, condemning the United States’ recent violent invasive act against your country,” he reportedly wrote. Pyongyang has denounced the US deployment of an aircraft carrier group to the region, saying it would respond by “force of arms” to “reckless moves”. Observers have said North Korea may conduct a sixth nuclear test soon, with activity reported at nuclear facilities, according to the website 38 North. Meanwhile about 1,000 US airmen and fighter jets are taking part in a combat training exercise in South Korea, reported Yonhap news agency. South Korea has sent about 500 personnel and planes. The Max Thunder exercise will last for two weeks. He is expected to discuss rising tension on the Korean peninsula with Japanese Prime Minister Shinzo Abe on Tuesday, when he heads to Tokyo for economic talks with Finance Minister Taro Aso. Mr Abe on Monday told a parliamentary session that diplomatic efforts were “important to maintain peace”, but “dialogue for the sake of having dialogue is meaningless”. He added that Japan needed to apply pressure on Pyongyang to “seriously respond to a dialogue” with the international community. Pence visits Korean demilitarized zone. US era of strategic patience with North Korea over. Mike Pence met US & South Korean military officers near the DMZ.